CPP's front sway bar kit comes complete with the frame mounts and bushings along with the complete end-link kit and hardware. Pictured are both the short and tall frame mounts. 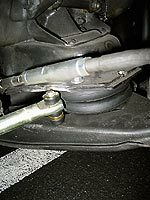 Since we're dealing with an airbagged truck, we weren't sure which combination of frame mounts and end-link spacers would provide the most clearance from the other components. The truck was lifted up to ride height, and then we jacked it up and placed jack stands under the lower control arms. It's no secret that sway bars are extremely beneficial to the handling capabilities of old trucks. It's also no secret that most of the '63-72 GM products did not come with them as standard equipment. Simply put, there is no easier or more cost effective way to improve upon the handling of your classic truck. The Classic Performance Products' sway bar is stout to say the least. Thicker than any of the stock units produced for these trucks, it has an overall diameter of 1.25 inches, is constructed from high-carbon steel, and comes gold/irridite plated. Using the stock holes in the control arm, end links with urethane bushings are installed to position the sway bar. Frame mounting brackets are also provided in the kit, and if they're there, use the factory holes in the frame. From start to finish, it took us about an hour to install the CPP sway bar kit. The install is a bit more involved on Old School due to the airbagged suspension than it would be on a standard coil-sprung truck. The reason is that you have to make sure that the sway bar does not interfere with any of the suspension components throughout the entire suspension cycle--which on this truck is over 8 inches. So follow along and contact CPP about their front and rear sway bars for almost any classic truck out there. CPP's frame brackets are made to fit the contour of the frame perfectly. Logical guys that we are, we started by using the frame brackets intended for lowered trucks. The first step is to install the sway bar onto the control arms using the end-link hardware. This size spacer is the norm for moderately lowered trucks. Next, the center bushings (with a bit of the supplied grease) were spread over the bar. Then the clamps were bolted to the frame mounts with the supplied hardware. Now the mounts were held up against the frame so it could be marked and drilled. Before we even had all four bolts snugged down, it became obvious that with this configuration, the sway bar would hit the Pitman arm of the manual steering box before the truck was fully aired down. By using the taller frame mounts, hopefully the sway bar would drop down enough to clear the steering. They were bolted up using the same holes in the frame. The sway bar was bolted up and rechecked. There was now plenty of room between it and the steering. All eight bolts at this end were then fully tightened down. Here it is installed. We put the truck back on the ground and cycled the suspension from fully raised to fully lowered. There was no interference, but we did spot something that needed a little preventative maintenance. The upper 'bag mount on the Air Lift kit is made to cover the spring hat and hangs out about 1/4-inch on either side. When dropping the truck down, the end of the sway bar just missed this extra bit of metal. We decided to trim it back a little with the die grinder to give it a bit more clearance. Just to be on the safe side, we pulled the spacer out of the end link. Now with the airbag fully compressed, the sway bar does not travel past the spring hat. Of course, changing the configuration meant that we had to cycle the suspension again, but the change actually yielded more clearance than before. There you have it. Even with the changes we were done in less than an hour. We didn't run Old School through the slalom course or anything, but I will tell you that I can now take the freeway onramp near the office at full speed without the tires squealing. Now that's progress.